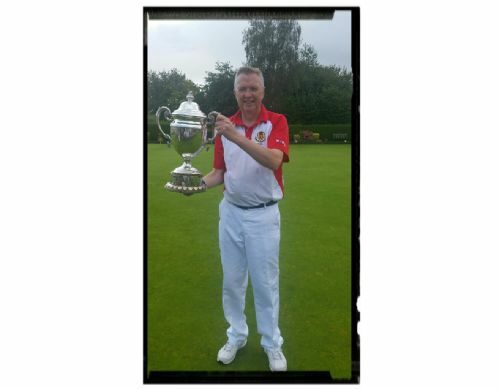 Our very own Roger Morgan has proved he is equally as good at the flat green game as he is at the grown green game. 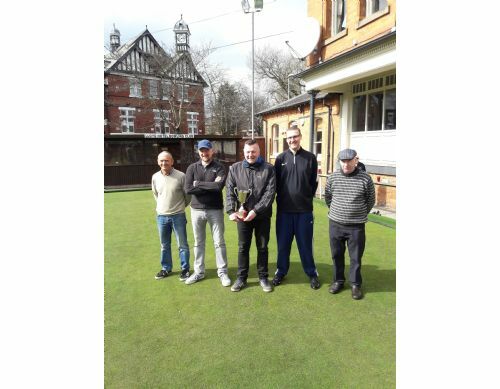 Roger proudly shows of the magnificent Whitchurch Bowls Club Mens Handicap Trophy. 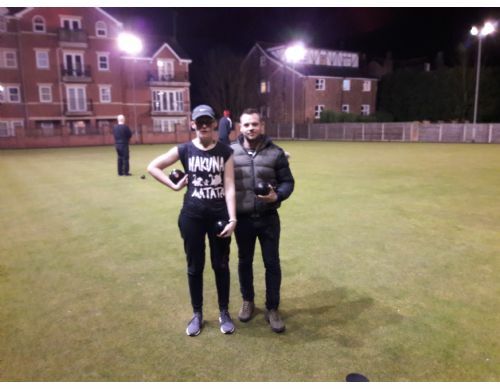 Amanda Ridley and Tom Mainwaring before their Wilkinson Trophy Quarter-Final which Tom won 31 – 28. Now no falling out you two! 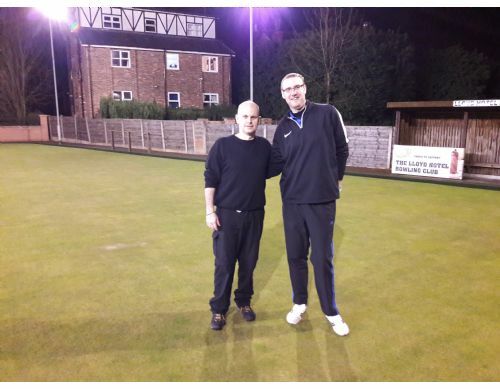 Graham Wells and Gerald Merry before their Wilkinson Trophy Quarter-Final which Gerald won 31 – 28. The “Battle of the Real Vets”! 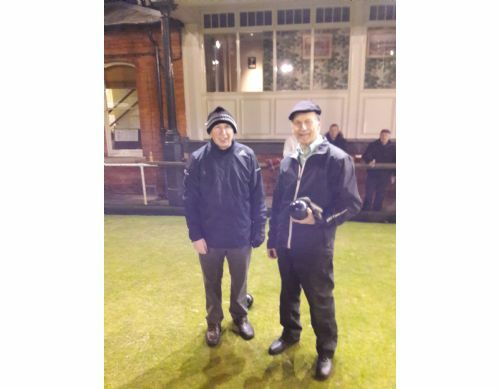 Damian Cormican and Ben Phillips before their Wilkinson Trophy Quarter-Final which Damian won 31 – 27. Ben so nearly snatched a victory from the jaws of defeat. 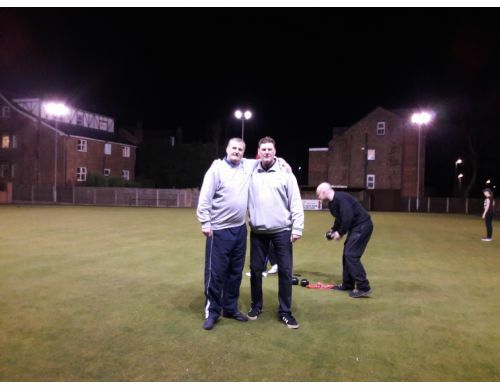 Steve Ridley and Dave Phillips before their Wilkinson Trophy Quarter-Final which Steve won 31 – 23. The “Battle of the Vets”! The Wilkinson Trophy Semi-Finalists … Damian Cormican and Steve Ridley and Tom Mainwaring and Gerald Merry. 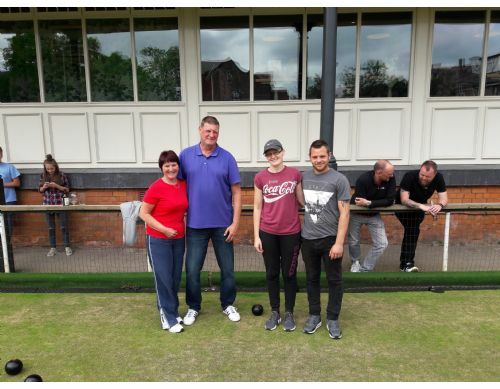 Steve beat Damian 31 – 22 whilst Gerald beat Tom 31 – 25. 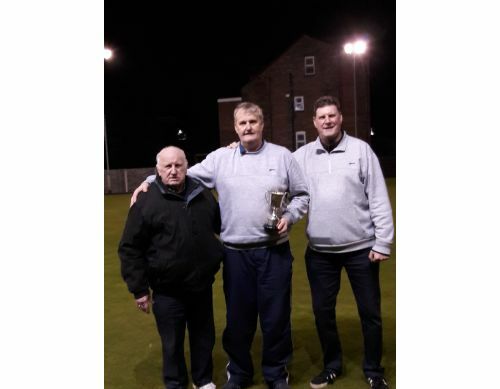 Wilkinson Trophy Finalists Steve Ridley and Gerald Merry with Club President, Liam Cormican and Club Chairman, Dave Phillips before their epic final which Steve won 31 – 28. 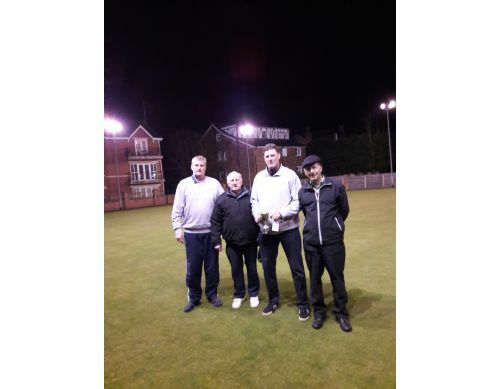 Wilkinson Trophy Winner Steve Ridley receives the prestigious trophy from Club President, Liam Cormican and Club Chairman, Dave Phillips. Well done Dad! 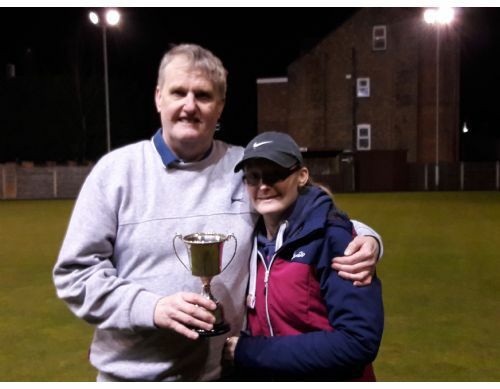 Steve Ridley celebrates his Wilkinson Trophy success with daughter Amanda Ridley. Keep it in the family!. It's Good Friday, it's the Chris Dooley Pairs, what a turn out. 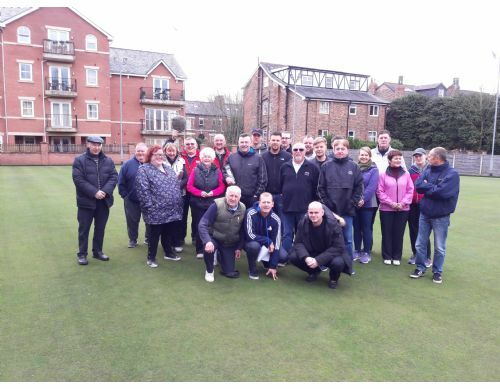 Thanks to Paul Dooley and Steve and Pat Cook for their sponsorship of this unique and great club competition. 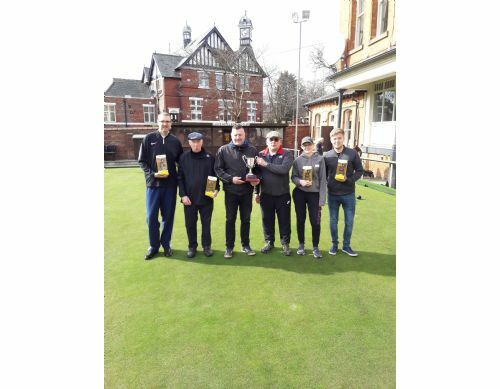 Mark Sandham & Craig McGuigan with Paul Dooley and Ben Phillips & Graham Wells before their Chris Dooley Pairs semi-final. Steve Cook & Liam Cormican with Paul Dooley and Amanda Ridley & Matt Sands before Chris Dooley Pairs semi-final. 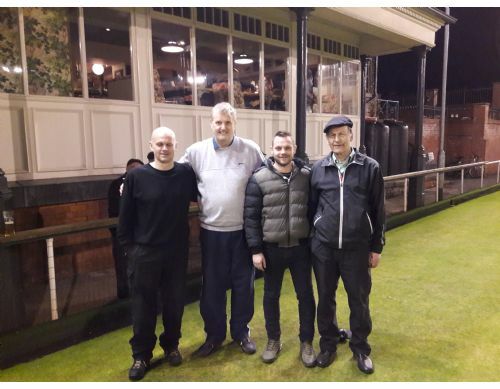 Chris Dooley Pairs Finalists Graham Wells & Ben Phillips with sponsors Paul Dooley & Steve Cook before their final against Matt Sands & Amanda Ridley. PS A special must go to the chocolate bunny rabbits. 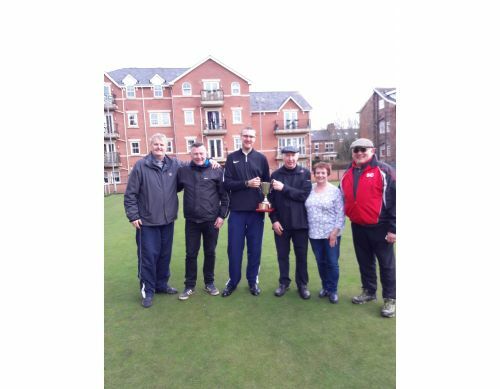 Chris Dooley Pairs Runners-Up Matt Sands & Amanda Ridley with sponsors Steve & Pat Cook and Paul Dooley. Well played Matt & Amanda, you were magnificent in defeat. 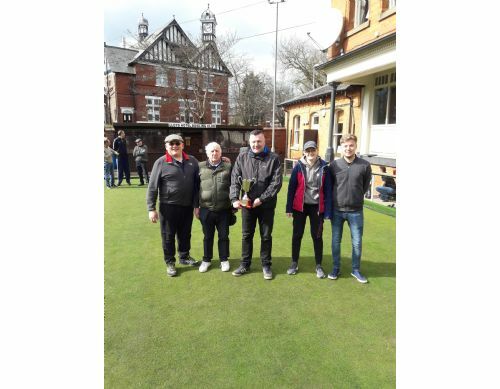 Club Secretary, Steve Ridley with Paul Dooley and Chris Dooley Pairs Winners Ben Phillips & Graham Wells with our other sponsors Pat & Steve Cook. Well played Banjo & Wellsey. Thanks Paul, Steve & Pat. 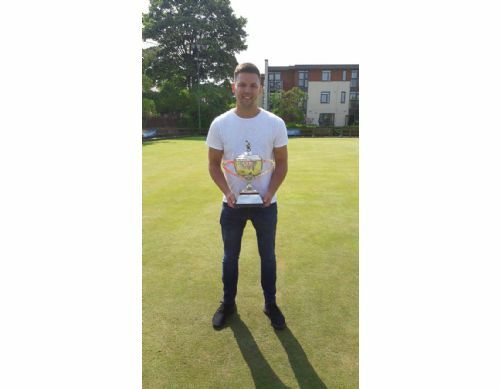 Ryan Sandham with the magnificent Greater Manchester County Parks Senior Merit Trophy after his 21 - 13 victory over Wayne Usher in the final. 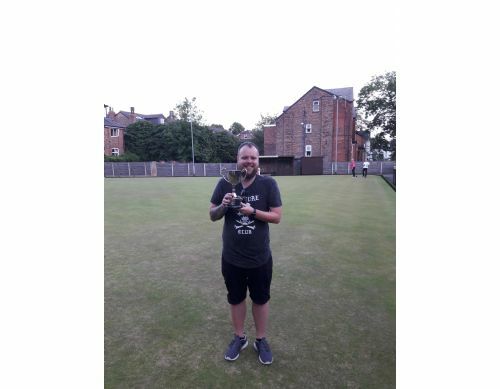 A delighted Gary "Minto" Minton with the Trafford Evening League Beryl Kirby Handicap Trophy after his recent victory over Keith Hamblett in the final at Navigation B.C. 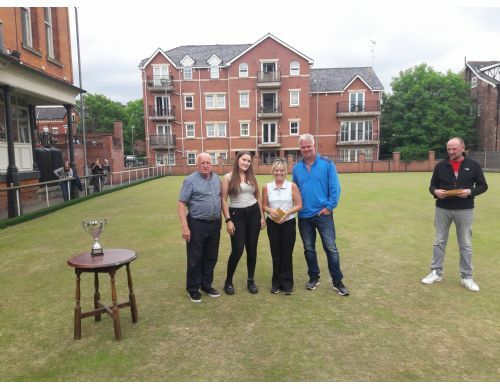 Club President Liam Cormican and Lorna Ridley Grandaughter present Andy Hamman and Julie Green with the George Ridley Mixed Pairs Trophy after their 21 - 14 victory in the final. 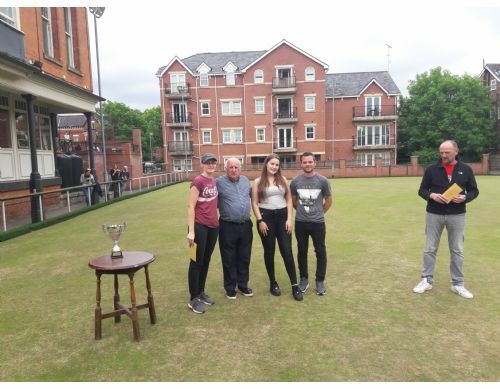 Club President Liam Cormican and Lorna Ridley Grandaughter present Amanda Ridley and Tom Mainwaring with their George Ridley Mixed Pairs runners-up prize money. 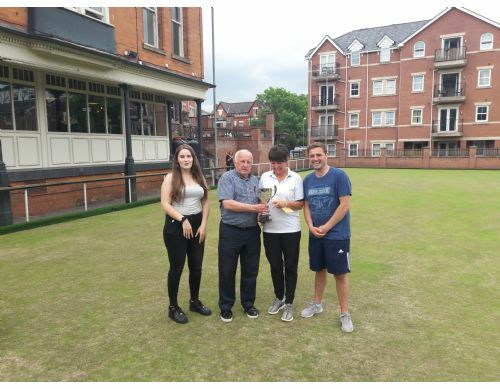 Club President Liam Cormican and Lorna Ridley Grandaughter present Julie Gardner and Dave McDermott with their George Ridley Mixed Pairs semi-final prize money. 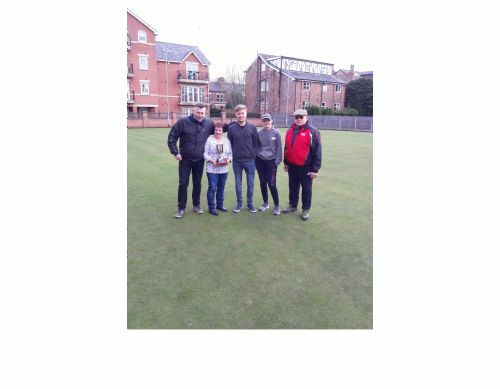 Club President Liam Cormican and Lorna Ridley Grandaughter present Carol Howarth and Dave Phillips with their George Ridley Mixed Pairs semi-final prize money. 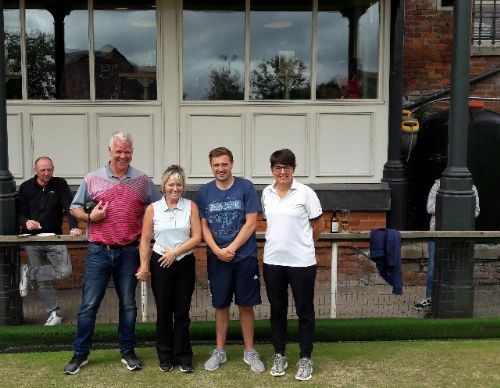 Carol Howarth and Dave Phillips with Amanda Ridley and Tom Mainwaring before their George Ridley Mixed Pairs semi-final. 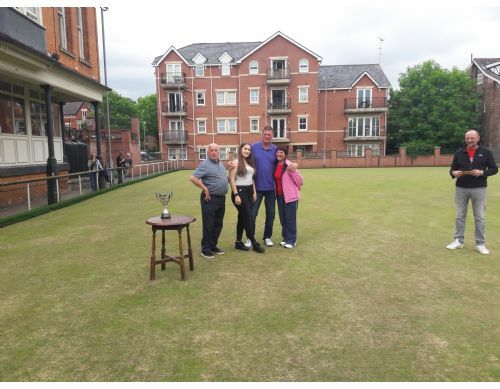 Dave McDermott and Julie Gardner with Andy Hamman and Julkie Green before their George Ridley Mixed Pairs semi-final.